Loon Lager, a buck a beer toasted by Premier Doug Ford this summer, is now selling for $1.65 per can. 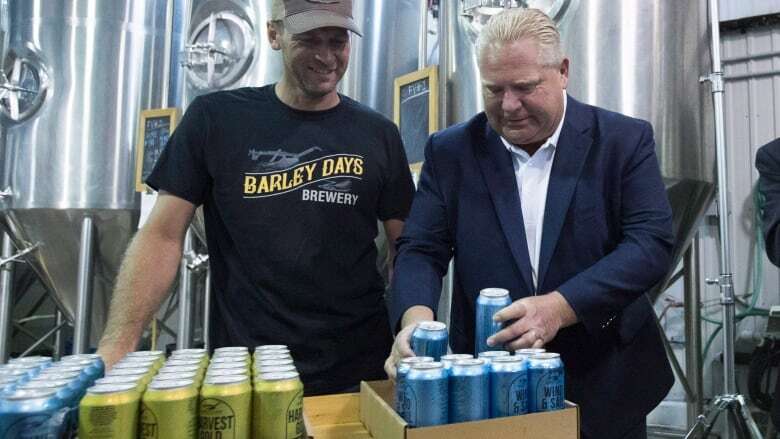 A buck a beer toasted by Premier Doug Ford this summer is now selling for $1.65 per can. Barley Days Brewery, in Picton, Ont., launched its Loon Lager brand after Ford's government lowered the minimum price of bottles and cans of beer to $1 in August and launched its "buck-a-beer challenge," which offered participating companies perks like prime spots in LCBO stores. Last summer, many Ontario craft breweries said they couldn't brew quality beer that cheap, while the big breweries largely ignored the government's plan. The Tories had said a return to buck-a-beer would see more competition in the beer market without affecting the province's revenues from beer and wine taxes. Despite the buck-a-beer setback, Ford's government has been making other changes to Ontario's alcohol rules. First, it extended hours for alcohol sales. Then, last week, the government opened public consultations on whether or not to allow private companies and corner stores to sell alcohol.